A U.S based company that provides security and performance to over 13 million domains—Cloudflare, Inc. has announced its first VPN product called Warp, for the benefit of every internet users, which aims to improve security and performance when browsing the Internet. Cloudlfare Warp VPN encrypts all Internet traffic, respects end-to-end encryption, and does not require that users install a root certificate on their devices.Unencrypted Internet connections will be encrypted but only between the user's device and Cloudflare's server (similarly to how all VPNs handle this). The same is true for all respected VPN services. How do I Sign UP for The Warp VPN? 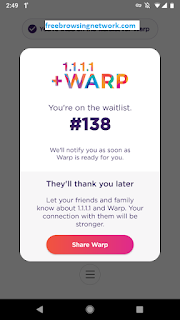 What you can do is claim your place in line to be among the first to get Warp. If you already have the 1.1.1.1 App on your phone, you can update it through the Apple App Store or the Google Play Store. If you don’t yet have the 1.1.1.1 App you can download it for free from Apple or Google. Once you’ve done that you’ll see an option to claim your place in line for Warp. As Cloudflare start onboarding people, your position in line will move up. 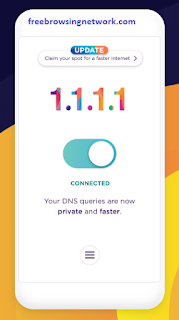 When it’s your turn Cloudflare will send you a notification and you’ll be able to enable Warp to experience a faster, more secure, more private Internet for yourself. Comment on "New Free Browsing Via Warp VPN"